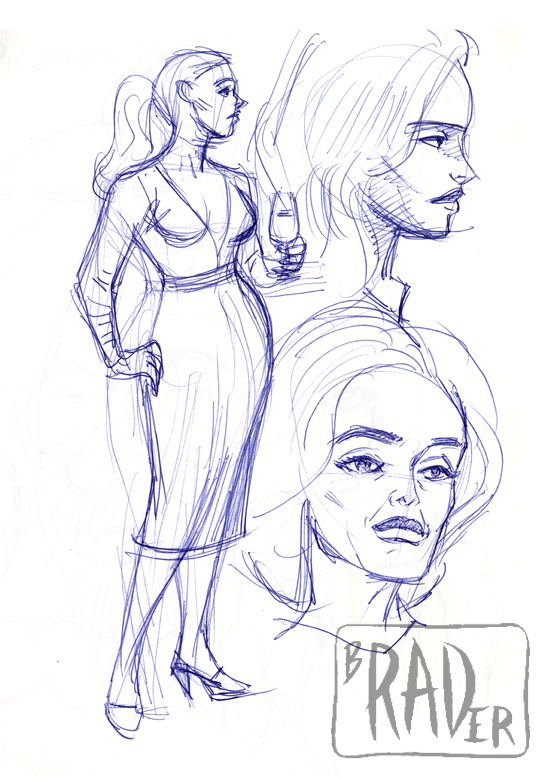 I designed Carla for the story, “Hat Trick”, which appeared in “All Crime Comics #3, published by Art of Fiction Press in 2014. I designed her in the same sitting as the 3 thugs. I was constrained in her design as she was a featured player in “All Crime Comics #1 and #2. I wasn’t happy with this pass, so I did an image search on line and settled on Diane Lane, who is exemplary of a woman still beautiful in middle age while not mutilating herself to look young. I also wanted a character different than Tracy, who, as it turns out, was the star of the episode. I didn’t know this starting out; the back half of the story wasn’t delivered to me until I’d already started on the front end. I was disappointed; I wanted to do more with the character than I was allowed by the script.